The arrival of Europeans in Victoria irrevocably changed the lives of the many Aboriginal groups inhabiting the area. Initial conciliation gave way to European arrogance and Aboriginal resentment stemming from the settlers' exclusive idea of property. Following John Batman's "purchase" of a portion of Aboriginal land the arrival of the pastoralists spelled the end of Aborigines' traditional way of life. Whilst various tribes resisted the takeover of their lands they were no match for the well armed and determined Europeans and the inevitable result was loss of life and dislocation. The system of Aboriginal protectorates introduced in 1836, and presided over by George Augustus Robinson from 1839, collapsed under the pressure of the settlers' land hunger and was scrapped within a decade. Reserves also failed, and whilst the missions provided a refuge for many people it was necessary for them to conform to strict rules which undermined their traditional way of life. The following sources contain contemporary documents and accounts relating to the early attempts of the Port Phillip administration to deal with the "Aboriginal question". George Augustus Robinson was appointed Protector of Aborigines at Port Phillip in 1839 after serving as Protector in Van Diemen's Land. He spent nearly eleven years at Port Phillip, but his work there was not impressive. The papers of George Augustus Robinson, chief protector, Port Phillip Aboriginal Protectorate - editor Ian D. Clarke. The Port Phillip protectorate was abolished on 31 December 1849. Black Robinson, Protector of Aborigines by Vivienne Rae-Ellis offers an interesting re-evaluation of George Augustus Robinson's life and work. 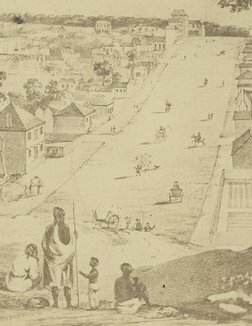 View of Collins Street looking west with a group of Aboriginal people in the foreground surveying the scene. Indigenous populations of Australia and the Torres Strait actively resisted British colonisation from the arrival of the First Fleet in 1788. Massacres of Indigenous Australians were designed to eradicate opposition. They were carried out secretly with few perpetrators brought to justice.This site presents a map, timelines, and information about massacres in Eastern Australia from 1794 -1872. It is the result of a project funded by Australian Research Council and undertaken at University of Newcastle.